Although there is general consensus among researchers that the economic downturn has played a key role in the recent health spending slowdown, experts have reached varying conclusions about the relative importance of structural factors, like changes to health insurance cost-sharing and Medicare payment policies. The latest health spending estimates are watched closely for signs of a continued slowdown or the beginning of an upward trend in spending. Monthly and quarterly reports of Gross Domestic Product (GDP) are key indicators of how the economy in general is doing. While these reports include a breakdown of health spending as well, that amount is considered very preliminary and is generally subject to significant revisions. The latest QSS results, released December 10, show possible signs of a modest uptick in health spending. 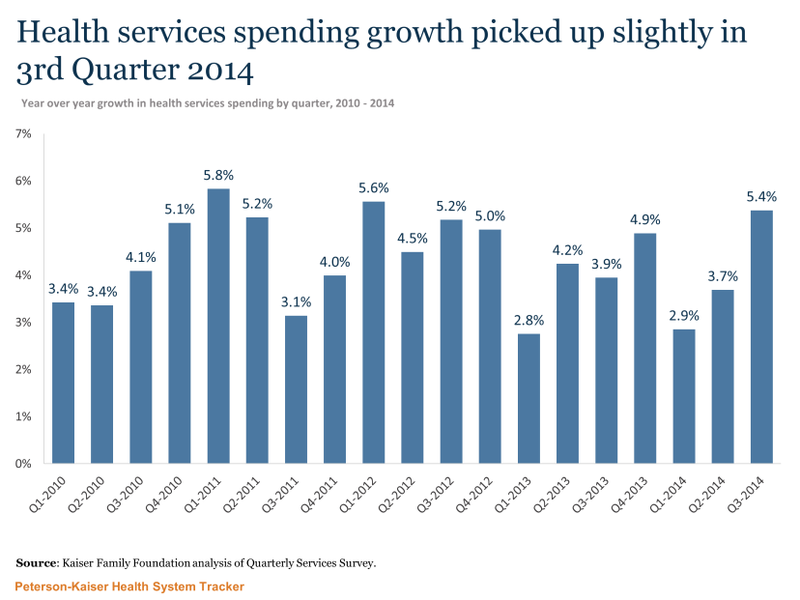 Health services spending in the 3rd quarter of 2014 grew 5.4% over the same quarter in 2013, compared to growth of 3.7% in the 2nd quarter and 2.9% in the 1st quarter. This modest increase in health services spending could be the result of more people insured through the Affordable Care Act and an improving economy. The latest figures could also simply be the result of volatility. Even with health care representing about one-sixth of the economy, quarterly spending estimates can swing significantly. In fact, we have seen growth rates over 5% in several quarters over the last five years. While we can read the tea leaves for signs of which way health spending is heading, it is too early to declare that a trend has taken hold.